Four of our New York-based illustrators, Damien Cuypers, Alessandra Olanow, Sara Singh, and Lauren Tamaki, were invited to do live illustrations at this weekend’s Food Book Fair. The Ace Hotel hosted the multi-day gastronomic oasis, and our illustrators created delectable portraits of food world luminaries: Cherry Bombe Magazine founder Kerry Diamond, James Beard award-winning cookbook author Amy Chaplin, and Morgenstern Ice Cream Parlor’s brainchild and namesake, Nick Morgenstern. Thanks for the feast! View Damien, Sara, Alessandra and Lauren‘s portfolio. 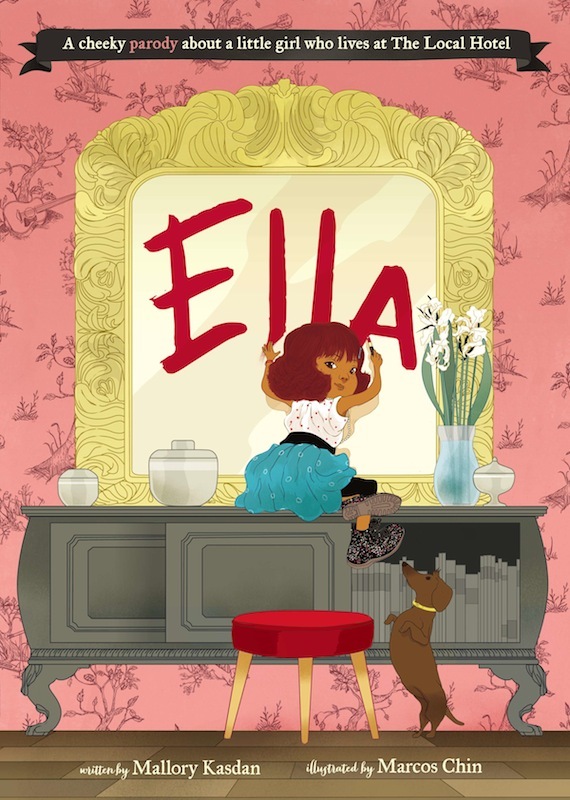 Marcos Chin collaborated with author Mallory Kasdan to illustrate Ella, a hilarious Eloise parody centered around an adorable 6 year old girl growing up in a local (read: NYC) hotel. Ella launches with a reading this Sunday, January 25th, 3-5pm at The Powerhouse Arena, 37 Main St. Brooklyn, NY 11201. View Marcos Chin’s full portfolio here. Tiffany&Co. invited Damien Cuypers to do live portraits of the guests at their annual Flagship store event. Check out the full coverage here. View Damien’s full portfolio here. Hope you can come to this panel discussion Thursday October 2 from 6-9pm at The Society of Illustrators, 128 East 63 Street. Panelists include our illustrators Carlos Aponte and Bil Donovan as well as our director Stephanie Pesakoff. Tickets are $15 for non-members, $10 for members and $7 for students and seniors. Just in time for NY Fashion Week, the Society of Illustrators presents a retrospective of the extraordinary illustrator George Stavrinos. The show, featuring over 100 of Stavrinos’ pieces, opens this Friday September 6 at 7pm at 128 East 63 Street. Suggested donation is $20 and all proceeds from the show will benefit Live Out Loud, a non-profit organization dedicated to inspiring and empowering LGBT youth. Marcos Chin will be speaking about his work Thursday, May 9 starting 7 p.m at the Apple Store, located in Grand Central Terminal. R.Nichols will be having a 24-hour sale of some of his original artwork via his website, starting Wednesday April 24 at 1pm EST. Prices range from $50-$245. View R.Nichols’ full portfolio here. Brooklyn Public Library presents a look at the work of several of the best NY-based working illustrators, including our own Carlos Aponte, Marcos Chin, Sara Singh and Autumn Whitehurst, alongside a retrospective of Antonio Lopez. The show runs September 6 through December 1 at the central branch of the library, located in Brooklyn at Grand Army Plaza. Alice Tait has illustrated ‘Good Bones Great Pieces’, published by Abrams, written by Suzanne and Lauren McGrath and with photographs by Lucas Allen. The writers are going to be in London this Wednesday 20th June for an event to launch the book in the UK at ‘Drink Shop Do’ on Caledonian Road, near Kings Cross. So come along and meet the authors and Alice! Drinks and canapés will be served and people will have an opportunity to purchase the book at a special evening price. See Alice’s full portfolio here. Working primarily as a digital artist over the last decade, Daniel considered what might happen if he were to pull out a blank page and begin to draw, not on commission and with no particular purpose in mind. The self-imposed minimum, one drawing a day, was to serve as an exercise to pull himself away from the computer and to begin to explore analog creativity. Within the spontaneity of this process, something interesting and new began to emerge. The final vocabulary of this long-term project has resulted in a curious bestiary cut from old accounting books and ephemera, brought to life with ink and paint, scissors and collage, resulting in an original and thoroughly whimsical world. We are pleased to announce that all 365 daily artworks are now on display at The Invisible Dog, Daniel Horowitz’s most comprehensive solo show to date. We are also very excited to introduce an upcoming exclusive collection of prints, selected from the “365” series, for Stampa, available April 9th. View Daniel’s full portfolio here.